On Wednesday, Dec. 5 – Day 2 of IDF’s Operation Northern Shield – Hizballah propagandists released a video showing the IDF uncovering a second assault tunnel, after 24 hours of “no comment” on the operation. It was shown as running up to the Western Galilee Moshav Zar’it. According to DEBKAfile sources, this tunnel was dug from the Lebanese village of Ramaya. The Hizballah video also showed heavy Israeli military equipment at work. Now, it was the turn of the IDF spokesman to withhold comment. Still no comment from the Israeli army spokesman. Hizballah is working hard to refute the claim by Israel’s Minister of Transportation Yisrael Katz that its chief Hassan Nasrallah is in shock. In fact, he is shown to be orchestrating a cunning campaign to ridicule the IDF operation as no more than a pointless exercise and run ahead of its spokesman. He is served well by three openings. The IDF, aided by sensational local media, made the mistake of overloading the first tunnel exposed on Tuesday – the one running from Kila in Lebanon up to the orchards of Metula – with four years of Israeli-Hizballah border history. Its presentation to the media was accompanied by graphic descriptions of events leading up to the present and included a claim that this tunnel was the designated gateway for the entry of special forces of Hizballah and an Iraqi Shiite militia for conquering Metulah. By sitting on the figures and exact sectors of the tunnels, the IDF opened the door for Hizballah to take charge of the propaganda surrounding its operation. There has been no word from the IDF on how the Metulah tunnel is to be disabled. Will concrete be poured into the passage? Will it be blown up? Will it be left as it is? For Hizballah – and even more for Tehran – this gap in the flow of information attests to hesitancy on the part of the IDF, or possibly an argument in high places on how to handle it. This outcome should have been decided before the operation began and executed expeditiously. Hassan Nasrallah, Hizballah’s chief, was able to enlist Lebanese Parliament Speaker Nabih Berri, the leader of a rival Shiite party in Lebanon and, in the absence of a stable government, the second strongest politician in the country. On Wednesday, Berri stepped foward to cast doubt on Israel’s claims of Hizballah terror tunnels. “The Israeli version of a tunnel in the village of Kila is dubious,” he said. He urged Beirut to demand the exact coordinates of the alleged tunnels and remarked: “If the Israelis want to go digging in their own country, fair enough. But if its excavations penetrate Lebanon, that is another matter.” The Shiite politician was clearly threatening Israel with Lebanese military intervention. What an entirely idiotic commentary. Oh that’s right Hizballah spent years and millions of dollars building a tunnel into Israel so that Israel could find it. What a brilliant plan. Or what a PR coup for Berri – that’s right it wasn’t Hizballah spending years and millions to build the tunnels it was the Israelis. Just so they could try and make Hisballah look bad? Here’s a question, how many moronic theories can be put in 7 paragraph article without my computer overloading and crashing? The monkey they showed in that one tunnel video was clearly Lebanese, half the Lebs I’ve met in my life look like his clone. I’m happy that Hezbollah is pleased to see their French welfare going to waste as the tunnels get dismantled. Make them even happier by detonating the tunnels directly under the buildings where they originate. Good comment once again Hizbollah is the one that made a pointless exercise of deception and wasteful digging of Tunnels and once again shows the only thing they did was “undermine” their own efforts of seeking to conduct attacks, when a Peaceful Handshake can resolve many differences among Neighboring Nations. Debka nails it all again. Once the Tunnel’s are have Mines, or Blown to Collapse, or filled with Concrete with Chips made Uninhabitable, they will another Legacy of Futility when there could be a Gesture of Sharing Peaceful Fruits Investments to advance both Societies Together with Armies, Warships, Rockets, or Tunnels on any Border, just like America-Canada. Time is valuable so pointless relationships aren’t needed. Last words to any Foe, don’t waste IDF’s time anymore with the unnecessary Hizbollah $pending Tunnel Wreck Society Life attempted on Israel-Lebanon Border. It is a Caveman’s Collapsing Cunning Scheme that went nowhere burying itself in the end. One can keep Digging and Building for Years but it only takes one First Day to find Tunnels, Second Day to display the Tunnels, and a Third Day to destroy the Tunnels. It is interesting to note that the Prime Minister’s “short victorious war” on “Hezbollah tunnels” followed a recommendation by Israeli police to indict Benjamin Netanyahu and his wife on allegations of corruption. This is the third occasion when the Israeli leader is being accused of corruption in 2018 alone. The accusations are of bribery and fraud in various forms. It’s possible that Netanyahu sees the operation against alleged Hezbollah infiltration infrastructure is a way to ensure a quick win that would show the Israeli people that their Prime Minister is, a top class leader and his government brings stability and security. Thus, he would be able to ease pressure caused by the corruption accusations and to remain in power for another period. After all a War President is a safe president…. I used to have a good impression of debka file, until yesterday with the article that the tunnels operation will boost these terrorists and animals statuts. Now this this one, I think I will never visit debka file again. Moreover, sometimes their information is not accurate and incorrect. The Tunnels could be furnished as Airbnb shelter accommodations. LPG / Propane & Butane mixed with enough air or air enriched with Oxygen and then burn the mixture and a nice blast wave will propagate through the tunnel burning the monkeys on the other side. This is not one of DEBKA’s better articles! The point of publicizing this anti-tunnel operation is twofold: 1) Lebanon and Hezbollah cannot pretend the tunnels do not exist, and 2) Israel knows the un will do nothing. Therefore, Israel has the moral right to fight the next war much differently. Any home sheltering a tunnel or weapons, or used to fire a weapon used against Israel, is now fair game. This is the IDF’s precursor for war. Israel has known of these terror tunnels since around 2006 after the war. At first they were in denial when residents in Metula and Misgav Am said they hear heavy machinery and digging under their homes. 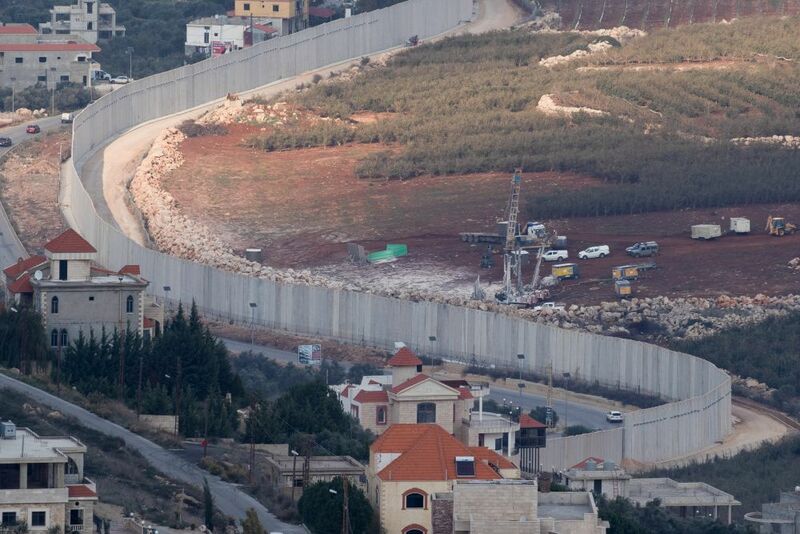 The fact is that Hezbollah has many tunnels – not just cross border tunnels. In 2006, the IDF lost many fighters because they didn’t understand the Vietcong- like tunnel warfare that Hezbollah unleashed. They are very good fighters and have the skills and training to put up a battle. The fact that Israel is exposing one of them now is to show the world that Hezbollah is in the wrong and Israel will have a legitimate reason to pre emptively strike those bastards. And when that happens, WW3 will be. God help us all. Time to put a smoke bomb in the tunnel, give it some time and then pump a high volume of air in then wait to see the smoke come out on the other side! During WW2 my father was in the US Army in North Africa, Sicily, and Italy. From time to time they would find a tunnel. Special MPs went to the tunnel and used a few drops of mustard gas. From that point on the tunnel could not be occupied or used. What the Israelis should do is finding the opening on the Israeli side and blow yellow colored sulfur gas and see where it comes out the other side. It would reveal the other entrance and stink up the tunnel and leave a yellow residue that would mark all that enter the tunnel. yeah, just like all the other wars that ur friends and fathers fought against israel; I have heard these threats for more than 70 years now. the only thing you dogs are capable of is to murder defenseless people, like sneaking into a house and killing babies and bombing the churches of the Copts in Egypt. you should go to the front lines and fight and not yap like a puppy dog from behind ur keyboard….